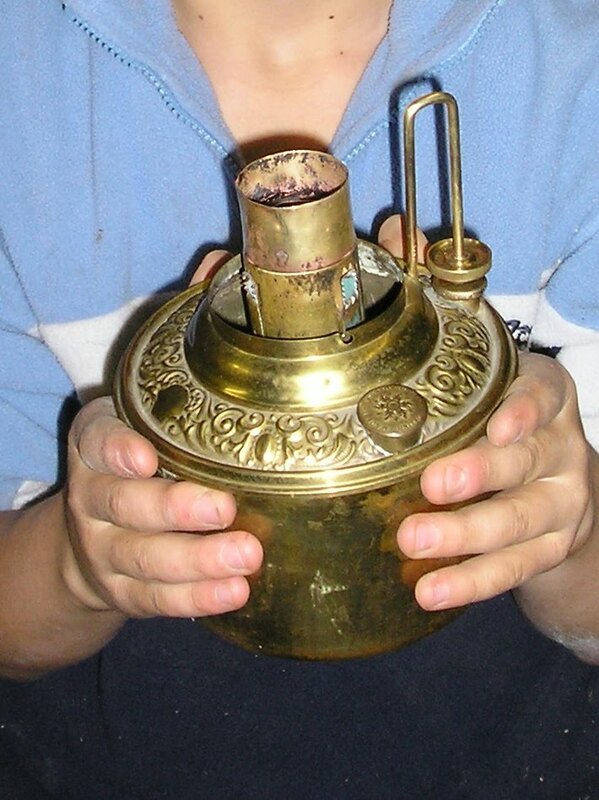 Below are photographs showing the process of restoring Miller Lamps. The first series is restoring a A1 quality embossed brass removeable font found in fine hanging and banquet lamps. The second are before and after photographs of a plainer Miller Banquet Lamp. Font as received. Prongs have been removed and replaced with a duplex chimney holder. 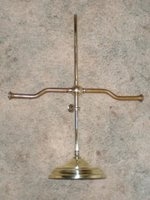 Further the wick raiser is nickel and centre tube is a piece of pipe. Side view, duplex chimney holder has been removed. All fittings and the pipe that was inplace of the centretube have been removed removed leaving a shell. 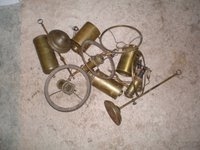 An old Miller plain nickel lamp, only good for parts - and it is parts that we need. The needed centre tube removed. Given that the spare parts are coming from a nickel lamp, it is necessary to remove the nickel plating. This is done by using a process that reverse the electro plating process that put the nickel there in the first place. This process and the solution it uses does NOT damage the brass in any way, unlike the chemicals that a electro-plater uses today. Fitting the now brass centre tube to the font. As it has come from a table lamp it is a little long and will require cutting. It is essential that the tube is positioned correctly for the wick carriage and raising device to work properly and that it is fixed to the font to prevent leaking. Soldering the repacement centrertube to the font. The repaired font, with all fittings, now brass, attached. - Now for the burner. Given that the original prongs have been cut away long ago, the prongs will need to be obtained from the top half of a spare burner. These prongs will be carefully cut away from its mounting ring and then gold soldered onto the rossette gallery. The compeletly reparied and restored font and burner, now in full working condition. 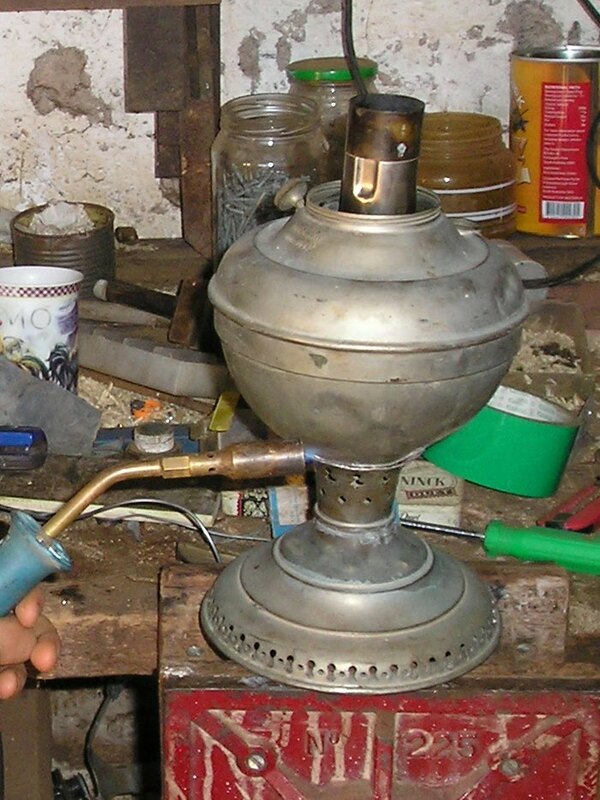 It is often necessary when restoring lamps to place them in solution to remove years of built up grime, paint (sometimes many layers of it) and muck. 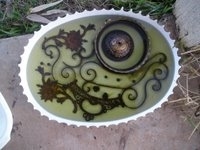 Again the solution used is such that it wont damage the brassware at all, or the nickel plating, if it exists. 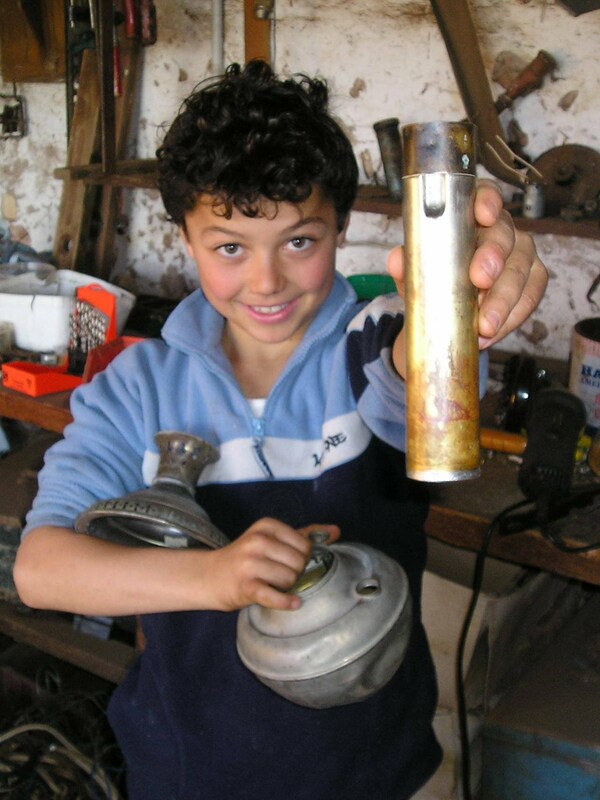 Of those lamps that are nickel, it is often the case that they were painted in the first place because of damage (heat, corrosion etc) to the nickel. In these cases when the nickel is badly damaged, an option is to then strip the nickel and return the lamp to polished brass. This, in my opinion, is better then having the lamp re-plated or leaving the lamp in an unpresentable condition that is not original. The lamp restored but not yet cleaned and polished. 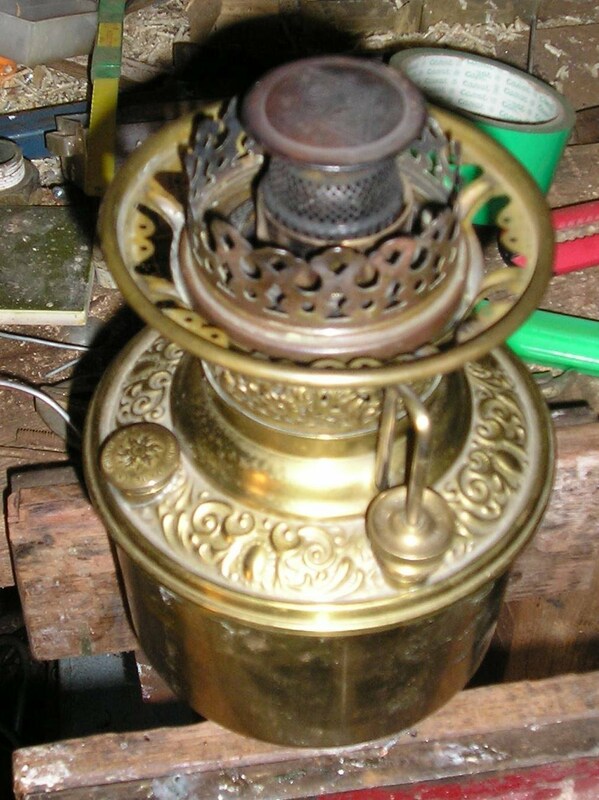 The burner has been repaired but the missing chimney ring with prongs is yet to be put in place, the centretube is also repaired. The brass mounting peg connecting the vase to the spelter stem caused the most work. 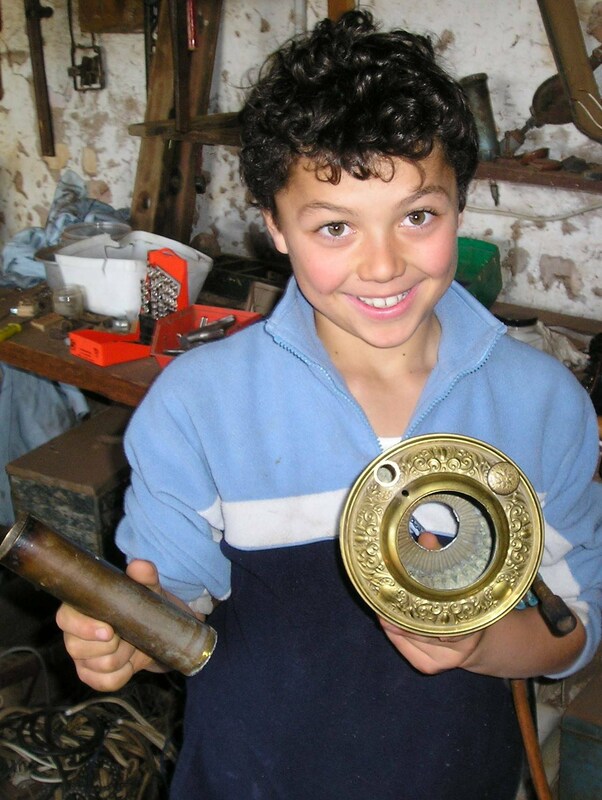 As much of it had been drilled away it was necessary to join to it a new piece of brass and re-turn it in a lathe. 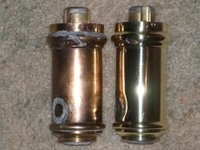 All of what remained of the original brass peg was retained. The finished lamp. Cleaning and polishing lamps like this has to be done with care, the dirt, muck and paint has to be removed, but in such a way as ensure that the electo plating (in this case copper plating on brass for the vase) is not damaged. The brass removeable font and brass mounting peg balances the copper vase nicely. A tripod for a 10" shade has been fitted, but this lamp would take a 4" basket for a globe shade just as well. Some 'before' 'during' and 'after' photographs of this lamp showing the restoration process. This photograph shows two incomplete double Miller No. 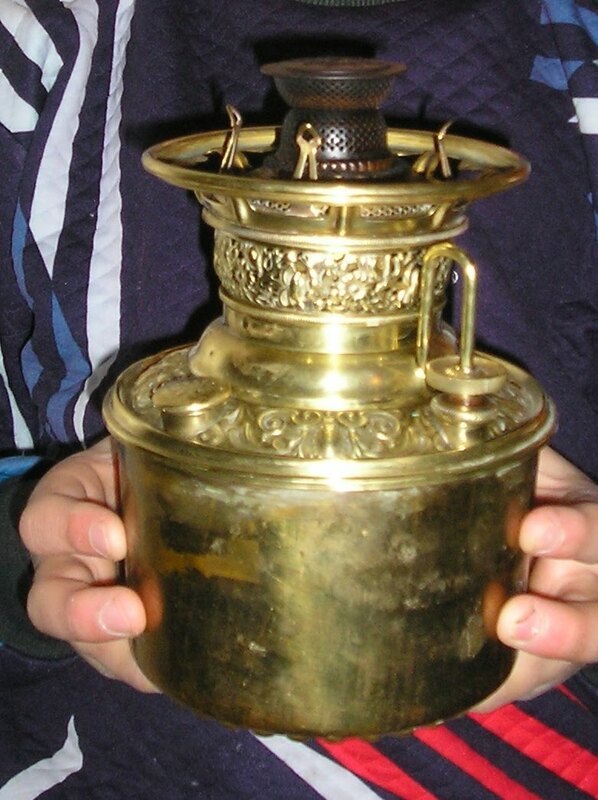 1 student lamps. One is the 'ideal' but having been electrified was missing many parts and had had Aladdin shade rings appaulingly soldered onto the wick cylinders (probably when it was electrified). 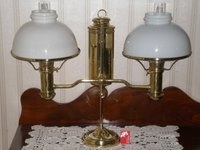 The other is a Vestal type double student lamp, maybe slightly earlier than the 'Ideal'. In very poor condition it did at least still have the original 10" Miller shade rings (albiet damaged) and flame spreaders. Surprisingly both lamps still retained both their wick flask drip cups. The two 'Ideal' embossed wick cylinders. 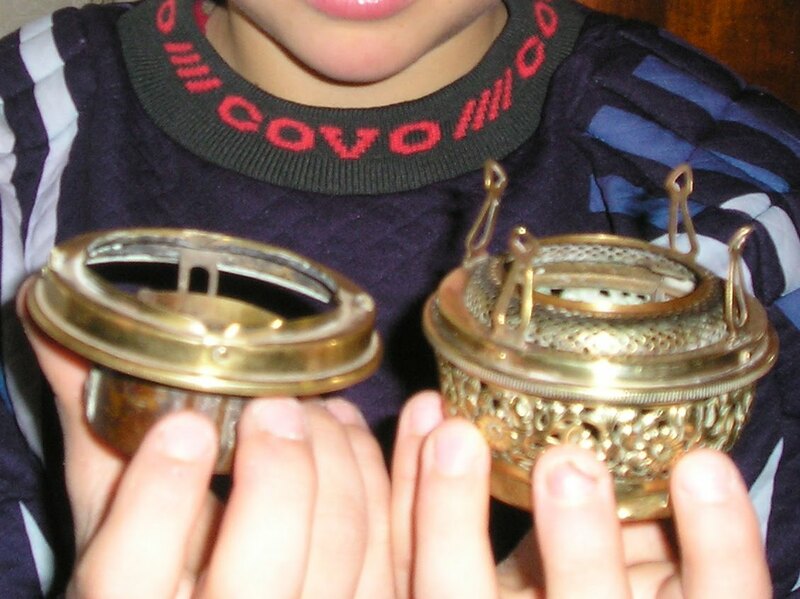 On the left, unrestored, but with the aladdin shade ring removed, the right, polished with all traces of excess solder removed. The thumbwheel shaft, which had to be removed to rid the flask of all that solder is yet to be replaced, as does the spreader holders to the centre tubes which were missing. At least they didn't 'cut' the tubes. The base, stem and retaining screw restored and polished with the now restored 'ball' in place and fitting the cross arms. The ball was the most difficult part to work on. Having been drilled not once but twice the stem tube had to be removed and the drill holes pluged with suitable brass and silver soldered into place. The ball has 3 parts and 6 solder joints, all within about 3/4" of each other and all needing to be watertight. - very difficult to achieve.